I hope you all had a fantastic day yesterday (12th December) - I certainly did! It was my 2 year wedding anniversary! My dear husband spoiled me to bits. First up it was a Monday, so that already had sad tones to it but I was quickly uplifted when I received an email from our secretary asking me to pick up a package. I thought for a second 'Oh it must be my sister in law sending me more of my Melbourne mail, oh but I told her she didn't have to do that'. Then I go to the reception foyer and our secretary says "What day is it today?" and I replied "Monday" and she said "No I mean is it a special day for you?" and I thought to myself how does she know???? is she on my facebook?? hahaha feeling silly then I replied "Oh um, my er Wedding anniversary" and she smiled and pulled out a huge box of white roses and a sweet letter from my dear husband. Isn't he the sweetest? Yes, I was in mushy mushy land. I also had no idea he had planned this but he managed to book us a table at the Aria Restaurant in Sydney. Popular Australian restaurant owned my super chef Matt Moran. Lovely views of the Sydney Harbour and Sydney Opera House. The good news with fine dining is that the servings are so tiny that I didn't compromise my healthy eating habits. So my healthy lifestyle is still going strong (yay!) and now I will leave you with this recipe. 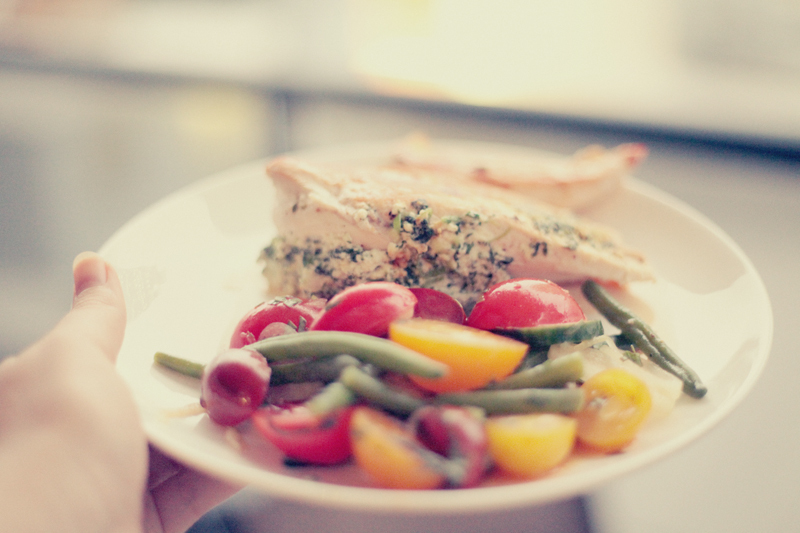 It's colourful and pretty to eat, this really helps to not get bored with my meals! I must admit that I didn't use the sherry vinegar with the salad as my pantry is quite limited here in Sydney, I only added lemon and olive oil as the dressing base. But I'm sure it's just as tasty! 2. In a medium bowl combine the ingredients for the stuffing. Season. 3. Cut a deep pocket into the thickest part of the chicken breast and fill with the ricotta stuffing. Enclose the filling using tooth picks. 4. Heat the olive oil in an ovenproof pan over medium heat. Brown the chicken on each side until well coloured, transfer to the oven and bake for 15 minutes until cooked through. 5. To prepare salad combine the cooled green beans, tomatoes, onion and capers in a large bowl. Add the tarragon, vinegar, garlic and oil and toss to combine. Yum - I'd love to try making that sometime soon. Thank Jess - I sure did. this looks delish...i am on it! thank you for sharing!